Flush with the success of appropriating the ragtime craze for commercial gain, the American sheet music publishing industry wasted no time in pursuing similar commercial success with the blues. In 1912, three popular blues-like compositions were published, precipitating the Tin Pan Alley adoption of blues elements: "Baby Seals' Blues" by Arthur Seals, "Dallas Blues" by Hart Wand and "Memphis Blues" by W. C. Handy . Handy, a formally trained musician, composer and arranger was a key popularizer of blues. Handy was one of the first to transcribe and then orchestrate blues in an almost symphonic style, with bands and singers. He went on to become a very popular composer, and billed himself as the "Father of the Blues", though it can be debated whether his compositions are blues at all; they can be described as a fusion of blues with ragtime and jazz, a merger facilitated using the Latin habanera rhythm that had long been a part of ragtime. Extremely prolific over his long life, Handy's signature work was the St. Louis Blues. 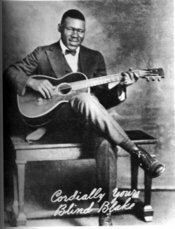 Blind Blake was an influential blues singer and guitarist known as the "King of Ragtime Guitar". In the 1920s, the blues became a major element of African American and American popular music in general, reaching "white" audience via Handy's work and the classic female blues performers. It evolved from informal performances to entertainment in theaters, for instance within the Theater Owners Bookers Association, in nightclubs, such as the Cotton Club, and juke joints, for example along Beale Street in Memphis. This evolution led to a notable diversification of the styles and to a clearer cut between blues and jazz. Several record companies, such as the American Record Corporation, Okeh Records, and Paramount Records, began to record African American music. As the recording industry grew, so did, in the African American community, the popularity of country blues performers like Leadbelly, Blind Lemon Jefferson, Lonnie Johnson, Son House and Blind Blake. Jefferson was one of the few country blues performers to record widely, and may have been the first to record the slide guitar style, in which a guitar is fretted with a knife blade, the sawed-off neck of a liquor bottle, or other implement. The slide guitar went on to become an important part of the Delta blues. When blues recordings were first made, in the 1920s, there were two major divisions: a traditional, rural country blues, and a diverse set of more polished city or urban blues. Country blues performers were often unaccompanied, or performed with only a banjo or guitar, and were often improvised. There were many regional styles of country blues in the early 20th century, a few especially important. The (Mississippi) Delta blues was a rootsy style, often accompanied by slide guitar and harmonica, and characterized by a spare style and passionate vocals. The most influential performer of this style is usually said to be Robert Johnson, who was little recorded but combined elements of both urban and rural blues in a unique manner. Along with Robert Johnson, major artists of this style were his predecessors Charley Patton and Son House. The southeastern "delicate and lyrical" Piedmont blues tradition, based on an elaborated fingerpicking guitar technique, was represented by singers like Blind Willie McTell and Blind Boy Fuller. The lively Memphis blues style, which developed in the '20s and '30s around Memphis, Tennessee, was mostly influenced by jug bands, such as the Memphis Jug Band or the Gus Cannon's Jug Stompers. They used a large variety of unusual instruments such as washboard, fiddle, kazoo or mandolin. Representative artists in this style include Sleepy John Estes, Robert Wilkins, Joe McCoy and Memphis Minnie. Memphis Minnie was a major female blues artist of this time. She was famous for her virtuoso guitar style. The pianist Memphis Slim also began his career in Memphis, but his quite distinct style was smoother and contained some swing elements. Many blues musicians based in Memphis moved to Chicago in the late thirties or early forties and participated in the urban blues movement, straddling the border between the country and electric blues. Bessie Smith was a very famous early blues singer. City blues was much more codified and elaborate. Classic female urban or vaudeville blues singers were extremely popular in the 1920s, among them Mamie Smith, Gertrude "Ma" Rainey, Bessie Smith, and Victoria Spivey. Though more a vaudeville performer than a blues artist, Mamie Smith was the first African- American to record a blues in 1920. Her success was such that 75,000 copies of "Crazy Blues" sold in its first month. Ma Rainey, was called the "Mother of Blues." 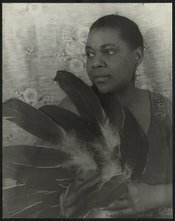 According to Clarke, both Rainey and Bessie Smith used a "method of singing each song around centre tones, perhaps in order to project her voice more easily to the back of a room" and Smith "would also choose to sing a song in an unusual key, and her artistry in bending and stretching notes with her beautiful, powerful contralto to accommodate her own interpretation was unsurpassed". Urban male performers included some of the most popular black musicians of the era, such Tampa Red, Big Bill Broonzy and Leroy Carr. Before WWII, Tampa Red was sometimes referred to as "the king of the slide guitar." Carr made the unusual choice to accompany himself on the piano. A typical boogie-woogie basslineAnother important style of 1930s and early '40s urban blues was boogie-woogie. Though most often piano based, it was not strictly a solo piano style, and was also used to accompany singers and, as a solo part, in bands and small combos. Boogie-Woogie was a style characterized by a regular bass figure, an ostinato or riff. It was featured by the most familiar example of shifts of level, in the left hand which elaborates on each chord, and trills and decorations from the right hand. Boogie-woogie was pioneered by the Chicago-based Jimmy Yancey and the Boogie-Woogie Trio (Albert Ammons, Pete Johnson and Meade Lux Lewis). Chicago also produced other musicians in the style, like Clarence "Pine Top" Smith and Earl Hines, who "linked the propulsive left-hand rhythms of the ragtime pianists with melodic figures similar to those of Armstrong's trumpet in the right hand". One kind of early 1940s urban blues was the jump blues, a style heavily influenced by big band music and characterized by the use of the guitar in the rhythm section, a jazzy, up-tempo sound, declamatory vocals and the use of the saxophone or other brass instruments. The jump blues of people like Louis Jordan and Big Joe Turner, based in Kansas City, Missouri, later became the primary basis for rock and roll and rhythm and blues. Also straddling the border between classic rhythm and blues and blues is the very smooth Louisiana style, whose main representatives are Professor Longhair and, more recently, Doctor John.